Greenhouses where a biological and integrated mode of husbandry is practised can be colonised by two predaceous fly communities that differ significantly in their life cycle and behaviour. One of these comprises dance flies of the family Hybotidae (Empidoidea) whilst the other comprises true flies (Muscidae) of the predaceous genus Coenosia Meigen, 1826. Studies on emergence abundance have shown that both groups of predators do not simply colonise greenhouses from the outside for short periods but that they can complete their developmental cycle in the greenhouse soil and can become established there for a long period of time. The species Coenosia atra Meigen, 1830, Coenosia attenuata Stein, 1902, Coenosia humilis Meigen, 1826, Coenosia strigipes Stein, 1916, Coenosia tigrina Fabricius, 1775, and Coenosia testacea Robineau-Desvoidy, 1830 (tricolor Zetterstedt, 1845) are members of the greenhouse predator community. C. attenuata is indigenous to the Palaeotropical region. Their prey spectrum also includes white flies, black fungus gnats and leaf-mining flies. Studies on the natural occurrence of these predaceous flies in greenhouses led to a recognition of the significance of this complex of beneficials for the control of important greenhouse pests. The species of Coenosia play a pre-eminent role in this. They can build up effective populations under greenhouse conditions, and as non-specific predators can feed on a variety of pest groups and on innocuous species. As they are the primary antagonists of the adult stages of black fungus gnats, white flies, and leaf-mining flies, they were selected from the complex of predaceous flies to be introduced as new beneficials into the practice of biological pest control. A three-stage method for rearing Coenosia-species was developed, using black fungus gnats (Sciaridae) as food. This led to the mass-rearing of the black fungus gnat, Bradysia paupera Tuomikoski, 1960, for the first time, using the fungus (Fusarium spec.) as food in a substrate of wood-fibre. Because of the cost of this rearing method, the scavenger midge Scatopse transversalis Loew, 1836, was used as an alternative food source, reared only using porridge oats on a wood-fibre substrate. In addition to reducing the time needed to supervise the cultures, this also avoided the danger of accidentally including pest species when mailing the Coenosia-puparia. Then followed studies on the biology and morphology of the pre-imaginal and imaginal stages of the Coenosia-species. Using C. attenuata as an examplar species, the immature stages which in principal are of identical structure were described using scanning electron microscope photographs. In the course of this, comparison of the posterior spiracles of ovarian larvae and mature larvae of C. strigipes showed that the larva hatches from the egg in the third instar and that no moult takes place prior to pupation. The cephalopharyngeal skeletons of the various Coenosia larvae are identical in structure and are adapted to the predaceous way of life. The length of development hardly varies among the species C. attenuata, C. humilis and C. strigipes. From egg laying to adult eclosion, it ranges between 40 and 43 days at 20ºC; and between 26 and 27 days at 25ºC. The results with C. atra were rather different, as development was completed after some 33 days at 20ºC, 10 days less than in the other species. 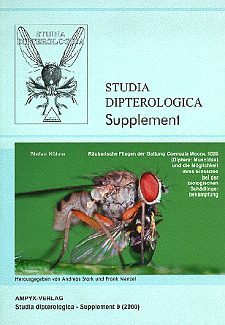 The performance of Coenosia-species as predators was studied comparatively by monitoring their consumption of vinegar flies (Drosophila melanogaster Meigen, 1830) and black fungus gnats (B. paupera) under various climatic conditions. Daily consumption depends upon the species of prey that is offered. Because of the smaller size of the black fungus gnats, their smaller body volume and weight in comparison with the vinegar flies, greater numbers of this prey species are consumed. For C. attenuata, the average number of prey per fly/day was 1.5 Drosophila compared with 6.9 black fungus gnats, i.e. 4.6 times as many; for C. strigipes the same figures were 1.7 and 7.6, i.e. 4.5 times as many. The daily consumption of prey did not vary significantly between C. attenuata, C. humilis and C. strigipes. C. atra proved to be the weakest species. If one examines the total number of flies taken as prey throughout the entire adult life, then more than twice as many individuals are taken as prey by C. strigipes when compared with C. attenuata and C. humilis, because of its longer life-span. In an experiment with a climatic chamber, the maximum age reached by a female was 95 days, and in an experiment in the greenhouse it was 102 days. The daily consumption of prey did not diminish with the increasing age of the fly. The effectiveness of Coenosia-species in controlling a black fungus gnat population was demonstrated in a laboratory experiment. In 1995, the method of rearing Coenosia-species in the laboratory was developed into commercial mass-rearing. In 1996, C. attenuata was brought into operation for the first time in various ornamental plant and vegetable cultures such as cucumbers and tomatoes, under the control of the State Plant Protection adviser. The effectiveness of this new beneficial was evaluated as overwhelmingly positive. In 1997, the species C. humilis was introduced into practice but on the whole these experiments were less favourably evaluated. The goal of introducing Coenosia-species into the system of biological pest control, as a complementary and prophylactic measure, promises to be successfully fulfilled in the future. Practical experiments have shown that wherever Coenosia is successfully established in a community, the pests are reduced in numbers, especially black fungus gnats, shore flies (Ephydridae), and in part also white flies. The prerequisite for successful establishment is a ground substrate that is favourable for oviposition and larval development, but it has not yet been possible to clarify definitively all the conditions that are required for this. It is suggested that the use of plant protection methods that do not directly affect the beneficials may in fact particularly endanger the Coenosia-species, because of their hunting behaviour which is based on ambush from a waiting position. In conclusion, it needs to be said that future improvements in the biological control of zoological pests in greenhouses will only be made with a complex of complementary measures. Provision with the so-called "banker plant system" will be of particular value for this, and must be further developed and improved in the future. New polyphagous beneficials such as the predaceous Coenosia-species support and complete the introduction of additional specialists, which form the terminal links in a chain of measures for the biological control of pests. Verschiedene räuberische Fliegenarten der Gattung Coenosia Meigen, 1826 (Diptera: Muscidae) können im Zierpflanzen- und Gemüsebau unter Glas wirkungsvolle Nützlingspopulationen zur Regulierung wichtiger Gewächshausschädlinge aufbauen. Zum Nahrungsspektrum der adulten Fliegen gehören Trauermücken, Weiße Fliege und Minierfliegen sowie indifferente Arten. Die ebenfalls räuberischen Larven leben in der oberen Humusschicht des Gewächshausbodens oder im Wurzelbereich der Topfpflanzen. Da sie sich auch von Trauermückenlarven ernähren, können sie zu einer effektiven Kontrolle besonders dieser Schädlingsgruppe beitragen. Neben einer Zuchtmethode zur kommerziellen Massenproduktion werden Beiträge zur Morphologie und Biologie der Fliegen vorgestellt. Versuche zur gezielten Massenfreilassung der Arten C. attenuata und C. humilis in Praxisbetrieben haben gezeigt, dass überall dort, wo eine Etablierung der Fliegen über eine Folgegeneration im Bestand erfolgreich war, Schädlinge, insbesondere Trauermücken, Sumpffliegen und teilweise auch die Weiße Fliege, reduziert werden. Die Möglichkeiten des gezielten Einsatzes von Coenosia-Fliegen im System der biologischen Schädlingsbekämpfung als ergänzende und prophylaktische Maßnahme werden diskutiert.